​​If you have recently suffered injury due to a road traffic accident, then you will be glad to know that we are here to help you make things right. 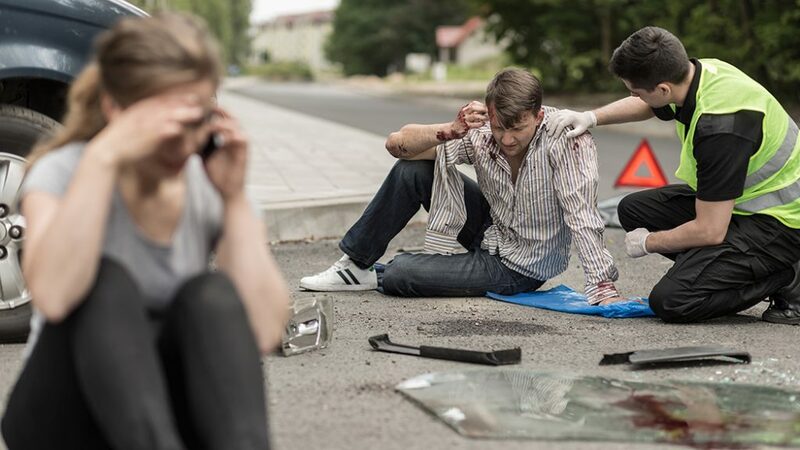 ​​We understand the kind of severity a road traffic accident can have on your life. Besides the physical pain, the psychological effects of being injured as you walk down a street, traveling as a passenger, or cycling to work are often quite traumatic. Considering that injuries can take time to heal, the effects of an accident can be both permanent and life-changing, and may even cause further complication. With that being said, the effects of a road traffic accident can be devastating at the very least. We cannot take away what you have been through; however, we help you go through the initial steps of making claims so you receive the finances and support you need as you recover. When you get in touch with us concerning your accident and injuries, we do not just consider the seriousness of your injuries – though we understand that this is crucial to you – we also consider the impact the injuries inflicted have on your family and your life. As such, we always do our best to listen to what you have to say and make sure that we understand how the injuries have affected you, your future, your work life, your spare time, and your loved ones. If the injuries have affected your normal routine, whether permanently or temporarily, we will look for ways for you to get compensation for the resulting changes. Can I Make A RTC Claim? While there are circumstances where you could take a while before making a claim (like in the event you or a loved one suffers brain or head injury) we can only be of assistance if the accident happened recently – within the last 3 years. If you are not sure about making a claim, then contact us today for impartial and free advice on ​0808 164 9153. We will be happy to answer any questions you have and should let you know if your case qualifies for a claim. One thing we strive to do is to ensure that we never pressure or rush our clients to make a claim. However, if you feel like you want to press charges and make a claim, then we can recommend to you one of our professional road accident solicitors for legal assistance and advice. However, there are experiences that don’t fall into either one of the above mentioned claims types. If that is the case for you, don’t worry. It is likely that we still can help you. What Is Considered During Compensations? Considering that each claim is unique to the individual involved in the accident, the things considered and what makes up the compensation will often vary. Since there are so many things to be considered when your solicitor is negotiating for compensation, we cannot truthfully tell you the amount of money you would receive before you start the accident claim process. However, our compensation calculator could give you a rough estimate of how much you could receive. Am I Entitled To An Early Compensation Payment? You could be entitled to an early compensation payment following a road traffic accident if the accident and injuries inflicted are/were severe. An early compensation payment, also known as an immediate needs payment or an interim payment, is given to persons in need of urgent financial support, especially if their compensation claim could take some time before it is settled. There are many factors that could facilitate for this, but the most common cause of release of immediate needs payment is when the cost of taking care of injuries cannot be facilitated by your current financial standing. For instance, these costs may include the cost of finding new residence for your family near the rehabilitation centre or hospital, or the cost of covering your mortgage, rent or bills since you are on a statutory or reduced sick pay. Whatever your needs may be, if you are not able to cater to your injury costs, your solicitor could push for you to secure a quicker compensation as they continue negotiating the final settlement. Once we have connected you with one of our professional solicitors, we will then invite you to a free medical assessment. This allows us to assess your injuries to see if you might need any extra care, support and rehabilitation so that you can get back on your feet faster. Through our connections to various rehabilitation providers, we will find you a rehabilitation services provider who can provide you with the support you need in no time at all. So, be it you were involved in an accident that left you needing an occupational therapist to evaluate your needs, counseling to feel safe again and adjust, or physiotherapy to recover mobility, we can help you find what you need. Who Will Pay For My Road Accident Compensation? Most accidents on the road are caused by motorists. With that being said, it is worth noting that if your accident was brought about by another motorist, be it a motorcyclist, a car driver, or a lorry driver, you will be compensated by their insurance. As such, you do not have to worry about the other person being left with a hefty bill that they cannot afford since they won’t be the ones paying. What About Road Accidents Involving An Uninsured Driver? If the accident that led to your injuries was by an uninsured driver, then you probably are worried that you might not receive compensation. The good thing though is that claims against uninsured drivers are paid in full by the MIB or Motor Insurer’s Bureau. All United Kingdom-based motor insurance companies are required by law to pay the MIB a certain amount every year so that those injured in an accident that involved an untraceable or uninsured driver may still receive some compensation. We understand how upsetting and frustrating it can be when a reckless driver refuses or avoids facing the consequences of an accident they caused. If by any chance, you could not get the details of the party responsible because they cannot be traced or found, then the MIB will often be the one to compensate you. Poor road and pavement surface conditions are another cause of road accidents. There is a person responsible for ensuring that every stretch of road is safe for use and well maintained. If the accident you were involved in was as a result of badly maintained road surfaces, then your local council or the Highways Agency will be the one compensating you for injuries and damages.